hope you all survived tax day yesterday! i was the genius that decided to leave my taxes down to just about the last minute, so yesterday was sweet relief for me. note to self: do your taxes early. always. depending on where you live, the weather has maybe been just as crazy as it has been in chicago. one day it’s in the 70’s, the next it’s snowing. not exactly what i had in mind for spring, but ya know, that’s cool. i find myself wanting to only shop and dress for spring and summer, but still stuck in my winter sweaters and boots. distressed and boyfriend jeans are coming back with a vengeance…and i love it. i like pairing them with heels and a dressy top for something a bit different. 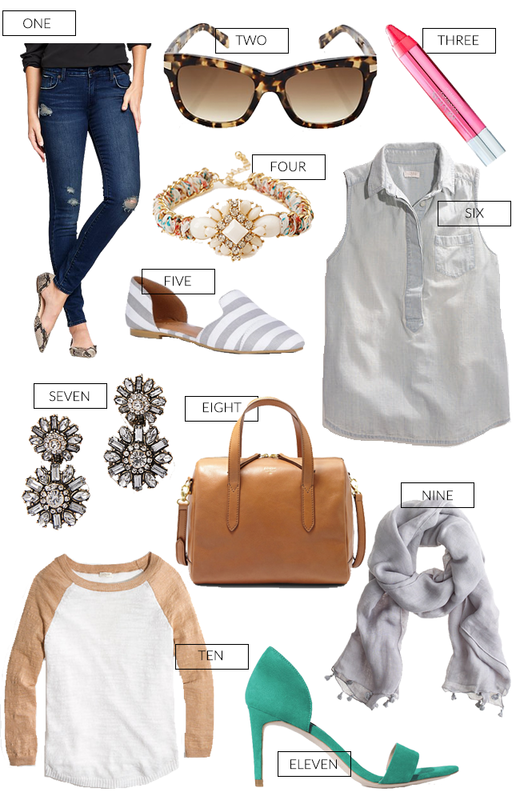 most days, my style is casual and easy – solid v-necks, skinny jeans, light scarves, you get the picture. this certainly isn’t changing for spring and summer. however, i’m adding some more colors and prints that i wouldn’t necessarily have picked last year, so i’m excited to branch out a bit. what is your spring/summer style?